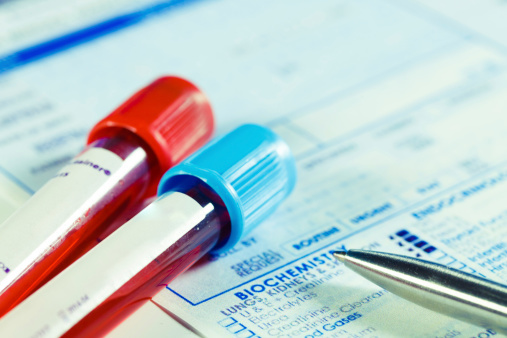 Often, a complete blood count (CBC), test is the first test a doctor performs to assess a patient's overall health. CBC tests are very common and can indicate abnormalities in the blood or in any particular part of the body, including the liver. CBC tests count the number of red blood cells, white blood cells, and platelets as well as the amount of hemoglobin found in the blood. Red blood cells are continuously made by bone marrow, which is found inside the bones. Red blood cells are responsible for transferring oxygen to every other part of the body. New red blood cells replace old blood cells once they meet. A normal* volume of red blood cells for a male is 4.32-5.72 trillion cells per liter of blood, and for a female it is 3.9-5.03trillion cells per liter. Hemoglobin is a protein molecule in red blood cells that carries oxygen. Hemoglobin is measured in weight. The normal* amount of hemoglobin in red blood cells for a male is 13.5-18 grams per deciliter, and 12-15.5 grams per deciliter for a female. What does a low result indicate? Low hemoglobin, otherwise known as anemia, is the single most common complete blood count abnormality. Anemia can result from a number of factors and deficiencies, including low iron levels, low B-12 levels, trauma, or certain hereditary conditions such as sickle cell anemia. What does a high result indicate? High hemoglobin in red blood cells, also called polycythaemia,may be the result of different factors including dehydration, circulatory problems, or the presence of a tumor. The hematocrit is the proportion of red blood cells to the plasma in the blood. The normal male hematocrit is 38.8-50 percent, and for females it is 34.9-44.5 percent. White blood cells are an integral part of the body's immune system, which fights infection. There are four distinct types of white blood cells that help defend the body from infection and disease. A normal* range for combined white blood count is about 4-10 billion cells per liter of blood. Low white blood cell counts can indicate a bone marrow disorder, an autoimmune disorder which destroys white blood cells, or possibly cancer. Low neutrophil, neutropenia, is often associated with an infection in the body. Leukocytosis, high white blood cell count, may indicate an infection or inflammation, lymphoma, leukemia or a reaction to medication. A doctor can perform tests to determine the cause of this result. Elevated eosinophil levels are often found in those with asthma or allergies. Platelets are the cells within the blood that are responsible for helping the blood to clot. Platelets rush to the site of a cut or wound to serve as a temporary protective barrier from the outer part of the cut, and prevent the cut from continuously bleeding.Platelets are smaller than red blood cells and white blood cells. A normal* range is 150 billion-450 billion per liter of blood. Low platelets count, also known as thrombocytopenia, may be a sign of an underlying medical condition or a side effect from certain drugs or medications. Be sure to talk with your doctor about all over-the-counter and prescription medications that you take. Symptoms of thrombocytopenia can include excessive bleeding or excessive bruising. High platelets count, thrombocytosis, can create a greater risk of developing thrombosis. Often occurring in the legs, thrombosis is a blood clot that becomes caught in the blood stream. Individuals with a low platelet count should attempt to avoid situations in which they are required to remain in the same position for an extended period of time, as this could contribute to thrombosis. If such situations are unavoidable, it is important to walk around at least once per hour. If periodic walking is impossible, a simple exercise of flexing and relaxing the foot several times may be helpful. *"Normal Ranges" are not normal for everyone and should not replace information provided by your doctor. Please note that individual lab reports may contain different parameters.